Taxpayer: To determine the nature of sale i.e. intra-state/ inter-state/ import/ export. Government: To determine the state where state component of GST would accrue. Principles for determination of supplies of goods and/or services in the course of intra-state or interstate trade or commerce are prescribed in Section 3 and 4 of the Model IGST Act, 2016. Broadly, intra-state supply of goods/ services means any supply of goods/services where the location of the supplier and the place of supply are in the same state. Inter-state supply of goods/services means any supply of goods/services where the location of the supplier and the place of supply are in different states. Manner to be prescribed by the Central Government on recommendation of GST Council. Specific services such as supply of restaurant and catering services, health service etc. Fixed line/ leased circuit, internet based circuit, cable or dish antenna à Place of installation of the fixed line/leased circuit etc. 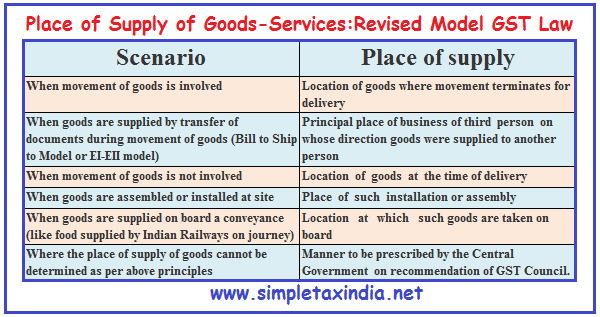 Principles of place of supply of services when the location of supplier or the location of recipient is outside India, has been drawn on similar pattern as existing in the Place of Provision of Services Rules, 2012 (“POPS”) for determining export/import of services from India/into India, with new inclusion of provision in case of ‘online information and database access or retrieval (“OIDAR”) services, wherein place of supply shall be the location of recipient. It is further provided that in order to prevent double taxation or non-taxation of the supply of a service, or for the uniform application of rules, the Central Government shall have the power to notify any description of service or circumstances in which the place of supply shall be the place of effective use and enjoyment of a service.The place of supply principles have been expanded to provide separate set of principles for import/ export transactions. Place of supply provisions for services are drawn on similar line as the existing POPS with certain modifications. Manifestly, it seems that honest attempt has been made by the Government to eradicate the daunting provisions in the First MGL, which can be very well seen in the above discussed provisions. However, it is required that the lawmaker should address the issues raised by stakeholders which are still left for the smooth transition to GST regime.